HONOR | Reflection of Glory! It is an extreme honor to be recognized for something that you have put your heart and time into. And I received this honor when I was recognized as Teacher of the Year by Westside Elementary School and then was also awarded the Ruth I. Shuler 2001-2002 Teaching Excellence Award by the Baker County School District. To be honored for my teaching by my school and then by my school district…and then having the opportunity to compete with other teachers in the State of Florida for state recognition…could there be a greater honor than this? And then when I retired in June 2011, I discovered there was a greater honor! 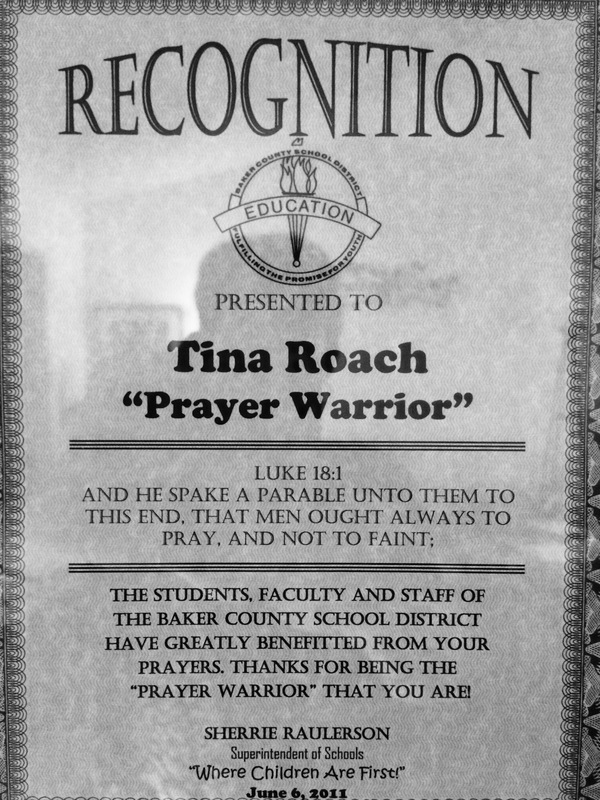 I was completely overwhelmed as the School Superintendent presented me with a beautiful plaque recognizing my ministry in prayer during my years of teaching. As with all public schools, we were not allowed to have prayer as a part of our school day. Prayer in schools was done away with years ago. But, when you are a vessel of the Living God, you are a vessel of prayer – that cannot be taken away by man. I had the opportunity to pray for our county schools, for our teachers, and for our students with other committed Christians during each school year. But, even more precious was the opportunity to pray with teachers I worked with and to walk through their joys and sorrows with them; having the opportunity to pray with mothers during parent conferences; and being able to pray over my classroom and over each child’s desk. I have a precious memory of a little 6 year old girl holding my hand and looking up at me with big trusting eyes as we were walking and saying, “Mrs. Roach, would you pray for my daddy? He is trying to find a job.” Was she told by a parent to ask me or did she just reach out to me on her own? I don’t know – but I prayed with her as we were walking – such a tender, precious moment. Yes, being recognized for my teaching was a great honor. But, being recognized for my ministry in prayer was an even greater honor. Whatever your career, job, or calling…remember prayer is an important, necessary part in fulfilling your life’s work. And prayer is necessary in living a fulfilling life! ← PLANTING OF THE LORD!